I've been on the DE QBell train since he was switched from O to D last fall. I, along w/ many others, hoped he excelled offensively at WR but it never came to fruition. He's putting up skill position type #s because he's been a skill position player for a duration. His calling naturally became defense due to his inability to catch passes at a respectable rate. I'm not shocked to see his 40 time & running performance because he was a respected T&F sprinter. If you guys can be patient I should have all of the FCS pro day results by the middle of next week. I'll post in a spreadsheet on here that is not missing anyone legit and has all schools. I also will have what numbers NFL teams are using and not what agents are giving to the media. Just ask you be patient. This is taking me a while to collect but I'm getting all the sheets. So far I'm just missing Bethune, SDSU, NDSU, EWU, and PVAMU and maybe 1 or 2 more. Where would you place the blame? FAMU usually has a pro day but they are a FCS school without prospects so no team went. They did not have a player on any lists thus no reason to go. They have had them in the past. Hopefully the agents of those kids got them in other school pro days. NFL teams go where they believe there are prospects and thus they don't believe FAMU has any prospects. Will this info include FCS Players that participated in non-FCS schools’ pro-days? another article withmore insights .. basically. anyone running the 1st 10 at 1.5 level, should be running the last 30 in 3.0 or less. Again, the 1.5 is very very good (think explosion/burst), but the athletes with top end speed requires the last 30 to be under 3.0 obviuosly .. so the 1.50 + 3.0 -s solid 4.5. Guys who run 4.4 and sub 4.4 are the ones really flying for the last 30 or 20 ... breakwy speed. Volcker is great athlete be he appears to be topped out due to his stride limits per formerpoke. one last post (I promise) to beat this topic to death ... Usain Bolt was clocked as the fastest human ever. But even that statement has to be qualified. 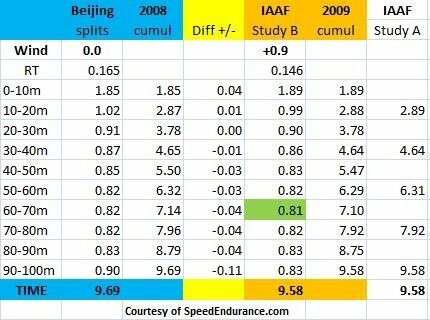 Below shows the 100m splits in 10m increments ... so it is not yards, but meters are about 10% longer than yards .. so adjust for that in your head. Look at Bolt's 1st 10m ... pretty below average ... that might translate to at best 1.65 seconds for 10 yards. But then look at his next 30m ... the 1.85 for 10m and the 4.65 for th first 40m .. that means he ran the next 30m in 2.8 seconds ... which might be closer to 2.6 if it were 30 yards (not meters). Not done even yet ... Bolt is fastest human ever, but does NOT reach his peak speed until the 50 to 80 meter range, with 60 to 70 being his peak speed and when he ran the fastes 27.8 mph ever recorded. - Total 40 yards: Volker 4.56, Bolt 4.30 ... this is breakway speed, and he's not done accelerating. This is what makes Bolt a freak and fastest ever .. his stride .. and you;ll notice he always is coming from behind the pack the first 50 yards before he pulls away. Again, Volckers first 10 yards is very very good, but his breakway speed is average. Having seen these measurables, he might get a long look at Slot Receiver .. or maybe move to safety ? That's also what made watching him so fun. Bolt was always losing the 100 in the first 25M and then it was see you later!